I noticed this post about one of Toby’s friends thinking through why people think of a god or gods, which reminded me of a conversation Toby and I had a few weeks ago. I was driving Toby home from his soccer class, and there was a decent thunderstorm going on. Toby made a comment about how god makes the weather, which I thought would lead to an interesting discussion about why he, or other people would think that. He told me that his Sunday school teachers told him that this is how the weather came about, and we also talked about the weather forecast and how it’s possible to learn how weather works and therefore make forecasts. Also he does know the general concept of clouds and rain and how that all goes together. As with Paul’s discussion with his son, we chatted briefly about why people think that god would make things happen, and how sometimes people will investigate how things actually work in order to understand the world around us. Then yesterday Toby saw the book on my nightstand – the recent biography of Albert Einstein. He (Toby) asked who the man on the cover was, and we had a little chat about how he was a very famous scientist and he was really good at asking how things work and what they are made of. It’s an interesting time with Toby – in some ways he’s very strong on personifying things he can’t quite grasp (which you could argue is a simplified religious leaning) and in others, like lots of other kids his age, he is very good at asking why (which leads to a good scientific way of thinking, like why is the sky blue, or why do we not fall off the earth). Muriel Hope, 91, tastes Scotland’s most expensive pot of tea, costing Â£23.80 at Plaisir du Chocolat in Edinburghâ€™s Royal Mile. I can’t really imagine her in a place called Plaisir du Chocolat, paying that much for some tea, or speaking about doing anything commercially, but I think that the age would match up, so I guess it really was her. Day … ooh … six or something of our trip to Bermuda. Losing track of the days, it’s just what we need. Today is the coolest day so far, but it’s relative – it’s actually about 70F and it’s still OK to wear shorts. It was warm in the morning so we decided to go to Bermuda Botanical Gardens. It’s a really impressive place, especially considering how little open space there is on the island. Some really beautiful and interesting trees and shrubs – lots of palm trees and an awesome banyan tree which is massive. We nipped into their little cafeteria for lunch, just a wee sandwich served by volunteer church-hall type ladies, all very friendly and quite British. Then as we were looking around the gardens and shivering a little (it had rained while we were having lunch and was quite cool for an hour or so afterwards) we noticed the aroma of something quite, um, herbal. Perhaps better described as something smokeable by the jazz community. It seemed quite incongorous, and we assumed that it was the brawny gardeners who were responsible rather than the nice ladies of the cafeteria. I got a phone call from my brother yesterday afternoon, letting me know that our granny, Muriel Hope, had passed away. It was expected, in that she was in her 90s and had been fading for the last few months, although she hung on a lot longer than medical people had expected – Edinburgh stubbornness maybe. 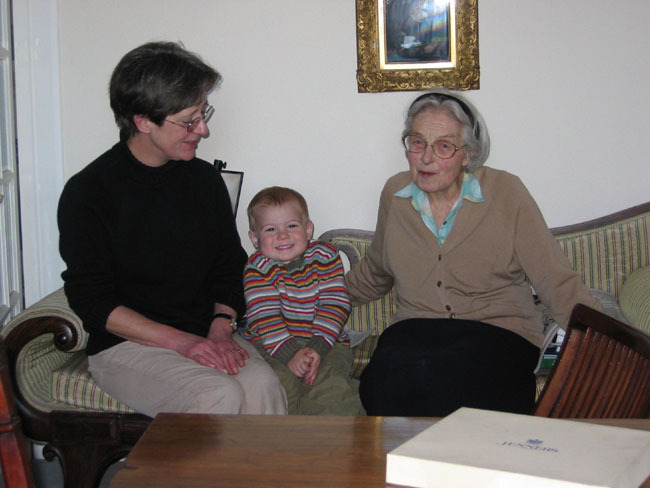 When she passed away she was at home, and most of her children were with her – three of my uncles and my mother. P.S. My cousin Tom also put up a post about her, with a lovely photo. You will notice he refers to her as Anne Hope – she never really liked being called Muriel and at some point in her 80s would always refer to herself as Anne, especially when she published historical articles. I remember she was very happy when my brother David was small and would call her Granny Annie. Toby is currently trying to learn how to tell jokes. Unfortunately, being four and a half, he doesn’t really get the concept. Around Halloween time we tried to teach him “What is a Vampire’s favorite fruit? A NECKtarine!” but although he would repeat it I don’t think he quite got it. Last night I did a barbecue (possibly the last of the year as it’s getting quite cold now) and did bison steaks – delicious – and found that amazingly my dad had never heard the joke “What’s the difference between a buffalo and a bison? You can’t wash your hands in a buffalo”. Toby tried to add some jokes of his own: “What if a door could walk? Um…” “What if curtains could move? The windows would get broken”. Etc. I think this is a development stage we have to go through (he does have a great sense of humor when it comes to slapstick) and in a few months we might start to get somewhere amusing. I hope. You are currently browsing the andrew.mogendorff.com blog archives for November, 2007.